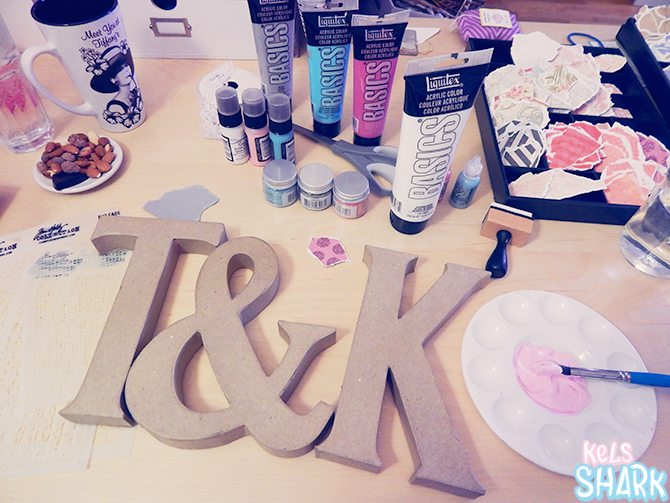 In true Kels fashion, I just used whatever felt right, trying out random techniques and materials to decorate the letters. As such, I can't really give you a comprehensive list of materials and instructions, but I'll include the basics. Besides, the whole point is to personalize it and to me, the fun of it is in trying whatever the heck you want! If you have questions about anything specific you see, let me know and I'll see if I can track it down for you. 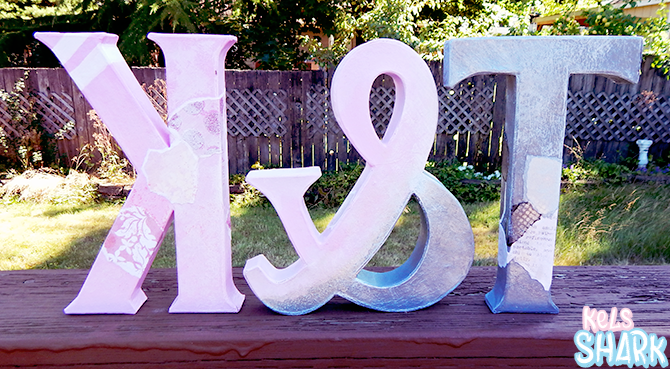 Also thought I'd throw in this pic of the paper mache letters from Paper Source that didn't make it into last week's post. 1. Start with a color story in mind. 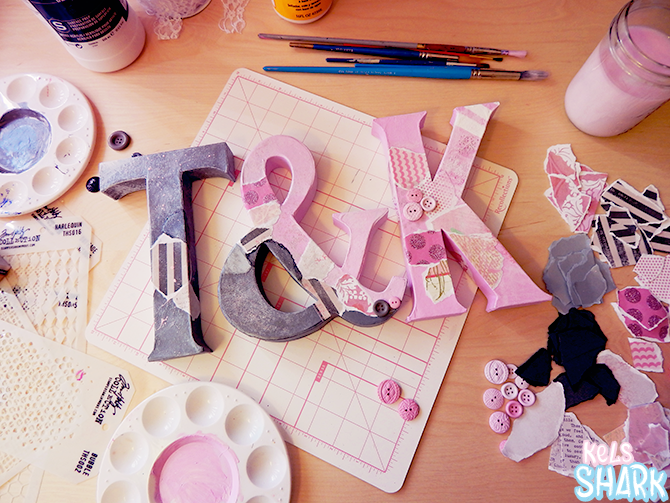 I wanted pink and grey and I thought it would be cool to have the ampersand be a transition point. I gathered everything I might use that fit the color story - paints, scrapbook papers, and other embellishments in my chosen colors. 2. Use the foam brush for steps 2-4. Apply a layer of gesso (optional). Once that has dried, apply paint in whatever color(s)/pattern you want. They're 3D letters, so don't forget the sides and back! 3. After base paint colors have dried, add scrapbook paper patches next. 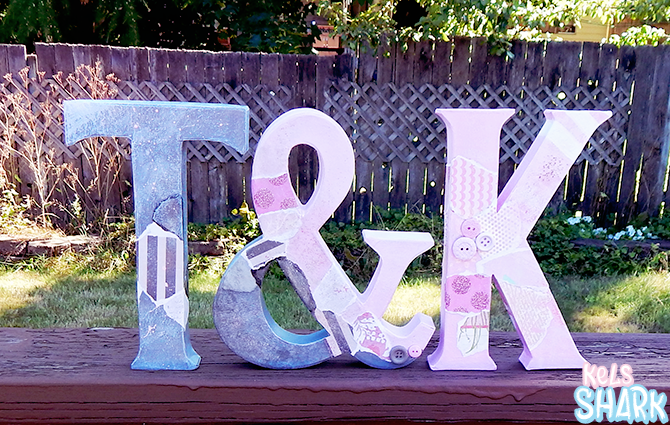 I tore up pieces of scrapbook paper and used Mod Podge to attach them to the letters. I made sure to smooth out any bubbles that formed beneath the papers and let them dry. 4. Once the scrapbook paper patches were firmly attached, I sealed each paper with a layer of Mod Podge on top. 5. Add other embellishments! I did random paint splatters, added glitter embellishments, tried out distress paints with the ink blending tool, and used the E6000 glue to attach the buttons. I had so much fun with this project and love how it turned out! These would also make fun gifts! 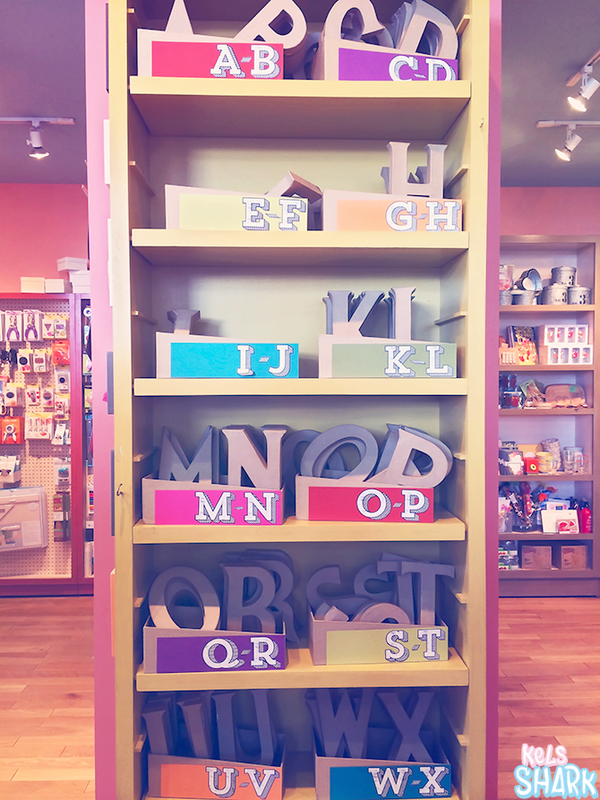 :) You could get letters that spell out something holiday-related and decorate them in a holiday color scheme, use them for wedding decor, or make a set for a friend. If you're making them as a gift, just keep in mind your friend's taste and the color scheme they decorate their home in! Thanks, Julie! No problem - I will share any future projects I use my cute buttons on with you as well!